One night in June 2010, New York composer Richard Einhorn went to bed in a motel feeling stuffy and woke up almost completely deaf. At the time, Einhorn, who wrote the oratorio Voices of Light, had limited ways to deal with his nightmare condition, known as sudden sensorineural hearing loss. He visited an audiologist and bought a hearing aid for $3,000. (His insurance plan, like most, didnât cover it.) Unhappy with the expense and the limits of the earpieceâs technology, which struggled to adapt to different noise levels, Einhorn began searching for alternative gadgets that could restore more of his hearing for lessÂ money. Today, he has a backpack full of them. To supplement his old-school hearing aid, he favors a $350 iPhone-linked earpiece made by Sound World Solutions, a hearing-hardware maker in Park Ridge, Ill., for whom heâs begun to consult. With the Sound World device on, he can amplify phone calls and streaming music as well as his surroundings. A third, $500 earpiece was custom-made by Ultimate Ears in Irvine, Calif., to help him detect a wider range of musical tones while composing. For restaurants and theaters, he has a $45 directional microphone that pairs with a $5 app to isolate desired voices. And for especially cacophonous places, he has spare $700 microphones, made by Etymotic Research in Elk Grove Village, Ill., that he can strap toÂ companions. Einhorn credits the audio patchwork with saving his career and his life. âItâs incredible,â he says over lunch in a busy restaurant, as he toggles the proper setting on his phone. The Bluetooth-connected earpieces arenât classified as hearing aids by the U.S. Food and Drug Administration. Theyâre called personal sound amplification products, or PSAPs. Basic versions of such devices have existed for more than a decade in lonely RadioShack aisles and a handful of other places. But in the past 18 months, advances in circuitry and low-energy Bluetooth transmission have helped developers radically improve the designs to make high-quality, long-lasting alternativesto hearing aids while keeping pricesat a fraction of the industry standard. Part of the reason PSAPs are cheap is that theyâre unregulated. Hearing-aid fittings and audiological calibrations account for much of the cost of aids from the big six makersâSiemens, Sonova, Starkey Hearing Technologies, William Demant, GN ReSound, and Widex. A midlevel pair that retails for $4,400 costs about $440 to manufacture, according to AARP. Research and development spending is also a factor: Unlike the free Bluetooth standard used by upstarts such as Sound World, old-school hearing aids run on proprietary signal processing and transmission technology. Siemens, Sonova, and Widex declined to comment; GN ReSound, Starkey, and William Demant didnât respond to requests for comment. Still, being kept out of doctorsâ offices has been a huge problem for PSAP makers, says Venkat Rajan, who tracks medical devices for researcher Frost & Sullivan. While the size of the market can be difficult to gauge given the lack of regulation, anecdotal evidence suggests sales have been soft, he says. It doesnât help that, according to industry journal the Hearing Review, the average American buying a hearing aid is 71Â years old. âTrying to find that customer base has been difficult,â Rajan says. The $300 Bean is the brainchild of Mead Killion, the co-founder of Etymotic. He invented the analog hi-fi amplification technology behind the device back in 1988, but says itâs only since 2013 that circuitry has become cheap enough for the product to be worth manufacturing en masse. His company uses the same technology in adaptive earplugs designed for orchestra musicians or infantry troops to keep music or conversation audible while dampening loud noises. A decade ago, Killion failed to persuade the FDA that early PSAPs should be sold over the counter. Heâs lobbying for a contract with the Department of Defense. Normally, I hear fine, but I conducted a hands-on experiment shortly before an interview with Killion. It became clear that having professional help putting these things in is a good idea. Initially, one Bean in each ear made it easy to hear faraway gossip in a noisy Whole Foods. Then I pushed them too far, and suddenly could hear nothing at all. Killion said the problem was waxy buildup in my narrow ear canals, so the next step was a $150 cerumenectomyâthat is, getting a doctor to scrape out gobs of wax and clear the blockage. Broadly speaking, an earpiece refers to anything that functions by either covering the ear, or hanging near the ear. In this broad category are the parts of an eyeglass frame that extend over the ear, and any material specifically designed to fit into the ear and block off the entry of sound or water. The most common meaning of an “earpiece” however is an electronic device that converts electronic signals into sound waves, and directs them into the ear. In this context, the earpiece can also be called an electronic-acoustic transducer. Originally, the earpiece was the only way of listening to electronically-generated audio signals. Thereafter, amplifiers were developed, and the role of earpieces became more a matter of personal preference than necessity. Nowadays, earpieces are used for convenience â where privacy is desired, or where mobility is important. Depending on its design, an earpiece can also be variously known as headphones, ear buds, stereo phones or headsets. what is an earpieceEarpieces can be organized broadly into two categories â wired earpieces and cordless or wireless earpieces. The wireless types use either radio waves or infrared signals to connect to the signal sources. Earpieces for CD players, computers or mobile phones are some examples. A signal transmission link is used, like BluetoothÂ® or Wi-Fi. The wired earpiece has to be physically attached to a signal source. To facilitate this, jacks at the end of the cords are inserted into the signal source. Jack sizes have been standardized, and the most common size is the 3.5 millimeter (about 0.2 inches) that was brought into the market by the Sony Company in 1979. The much older, 1/4 inch (about 6.4 mm) jack is now used only in professional equipment. When wiring up the stereo jacks, the tip is always the left channel, the portion in between is the right channel, and the outer sleeve is the ground. The use of ear buds has a profound impact on how one perceives sound. This is because an earpiece feeds the sound directly into the eardrums, without the normal acoustic contouring by the listenerâs head and outer ear that normal loudspeakers give scope for. Lacking these spatial references, the brain then imagines the sound to be in a straight line within the head and between the ears. This strips the sound of its 3 dimensional effect, otherwise produced by the normal loudspeakers. From their shapes and sizes, earpieces can be placed into four categories. The circum-aural types have large pads that surround the outer ear. They are most commonly used in recording studios. The supra-aural headphones fit just over the ear, without fully surrounding it. Ear buds are designed to fit inside outer earâs canal. However, they donât fully cover the canal, and exterior sounds can still be heard around them. In contrast, canal phones, the fourth category, fit snugly into the earâs canal, and effectively block off the external sounds. The spy earpiece is a gadget of the future that facilitates our lives. With the spy earpiece invisible communication is performed in most troublesome situations when cover assistance is necessary. The main feature of the spy earpiece is its complete invisibility. First of all, the spy earpiece goes in beige hue that is very close to skin color. So when you insert it into the ear, nobody can even notice it. Besides, the spy earpiece can boast of super tiny dimensions that ensure absolute invisibility of the gadget when it is in the ear. The good news is the spy earpiece is available on the market in diverse gadget sets. The most popular of them are Bluetooth Set, Watch Set, MP3 Set and Glasses Set. Each one of the sets listed above has an in-built transmitter and a microphone (in the loop for Bluetooth and MP3, in the bow of the glasses and on the reverse side of the watch). Thanks to the transmitter, the gadget gets connected to the cell phone. And thanks to the sensitive microphone your partner will hear your every word even if you whisper. So, as you can see the spy earpiece set consists of the transmitter with an embedded microphone and a spy earpiece with a battery. Â· Put the transmitter. If you use the Bluetooth or MP3 spy earpiece set, you are supposed to put on the loop round your neck. Make sure that the loop is properly hidden under your clothes. For Spy earpiece Watch set you put on the watch on your wrist, and for Spy earpiece Glasses set â just use it like ordinary glasses. Â· Insert the battery into the spy earpiece. Every set comes with a detailed guidance for that, so donât be afraid of doing something wrong. Anyway, if the quality of sound is unsatisfactory, try to change the position of the battery. Â· Put the spy earpiece into the ear. Here you should remember that you always have to clean ear canals beforehand. Otherwise, the spy earpiece filter will choke up with earwax and sound will deteriorate significantly. In the worst case the spy earpiece will fail to work. Â· Make a call. When you are ready with preparations just make a call and put the cell phone into your pocket. You wonât need it any more. Now the covert communication is established. You can hear what your partner is saying. Â· Pull the spy earpiece out. This is very easy to do thanks to a special ejection cord every spy earpiece has. You can see it in any picture. Â· Take out the battery. Be careful about pulling out the battery. You have to do it only with the help of a paper pin so that not to damage the spy earpiece. In case you wonât take it out, the battery will discharge. With the help of the spy earpiece you will never feel embarrassed and confused when speaking in public, writing a test, having an interview or taking an exam. 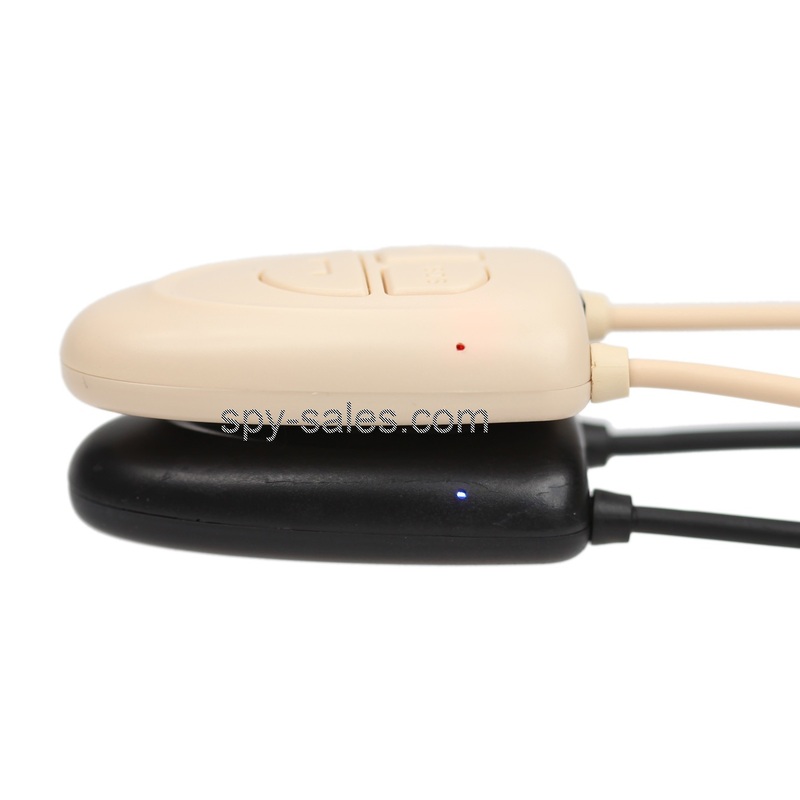 The spy earpiece will help you to feel confident and be successful. A covert earpiece does not contain any visible wires and is designed to fit inside the ear without being noticeable to the general public. Some devices are even designed to fit on a pair of eyeglasses while amplifying sound inside a personâs ear. An inductive wire is sometimes worn around the personâs neck, but is covered by clothing so as not to be discovered by onlookers. This wire is not connected to the covert earpiece, but connects to a separate radio device that helps modulate sound. â¢ Cost. You certainly do not expect to spend a lot on this gadget. As much as you do not want to spend much, it is important that you consider the price. Ensure that you go for something that has a reasonable price. This will ensure that you get what you are looking for plus full value for your money. â¢ Quality. Price will certainly dictate quality. Quality earpieces produce clear sound. Additionally, quality means that the earpieces are durable and can endure any type of conditions. â¢ Brand name. The brand name on the earpiece is also very important. Therefore, ensure that you only go for a gadget that has been manufactured by an experienced company. â¢ Reviews. You might want to seek the opinion of people who have used the brand that you want to go for. This will ensure that you get an overview of the product you want to purchase. â¢ Quality. This is a high quality gadget that gives an outstanding performance. The sound produced is of high quality and crystal clear. This does not pose a threat to the well being of your ears. This makes the earpiece very reliable. â¢ Durability. The material used in manufacturing the earpiece will ensure that it serves you for long. Additionally, the earpiece is able to withstand any condition without wearing out. â¢ Widely used. The wide use of this radio earpiece is more than enough assurance that you are purchasing a high quality product. â¢ Ideal for privacy. At times you might require taking a message discreetly. The Motorola radio earpiece will ensure that you receive the message in a clear manner. â¢ Striking features. The 3.5 mm jack makes it possible for you to use the earpiece with different gadgets. The earpiece is also built to enhance comfort while using it. It is compatible with: DP2400, DP3400, GP340 and CP040. As we wrote earlier this month, any technology that aids in communication, from a walkie-talkie to a Skype account, is technically a communication technology; therefore, it also follows that anybody who works in these different areas can call him/herself a âcommunications engineerâ. There is a obvious, present and growing danger to the whole population of the UK from contact to the whole non-ionizing segment of the electromagnetic spectrum. The danger can’t be overstated because most non-ionizing emission injuries happen clandestinely, usually do not become obvious until after many dormant years, and when they do, the effects are rarely documented. Since the development of mobile phone equipment, studies have been conducted to see if they cause health risks. The fear is rational, given that mobile phones are low-powered microwave emitters, and some microwaves have been revealed to cause health risks. Consumers and Experts agonize that keeping a microwave emitting gadget near your head and/or brain could put you in danger for brain cancer or other harm. The fear is now and again greater in regard to Bluetooth earpieces, as the gadget is located inside your ear and thus even nearer to your brain. Because Bluetooth earpieces are such a new facet, it is not possible to get statistics about continuing effects of constant contact. Some propose that inside 20 years, advanced studies will be presented, as the first generation to grow up using mobile phones and earpieces will in fact be guinea pigs for lasting effects. If you are really worried about the microwave emission from your mobile phone, don’t use Bluetooth earpieces and simply use the speaker-phone alternative that is standard on most Mobile phones. even though exact study has not provided comprehensible solutions as to whether Bluetooth earpieces can result in cancer, this may be an area where you feel it is better to be safe than sorry. In conclusion, it does seem unlikely that your mobile phone can give you cancer. It seems logical enough to the earpiece assume that we’d all be feeling the effects by now, after nearly two decades of mobile phone use (the second of which actually involved the majority of the population). However, nobody really knows for sure… Dr. Zaret may yet be proven right as the prophet of doom (but, of course, we have to hope not). A Czech-Republic based security firm (Avast), have ruined everybody’s fun by pointing out that, even when your old phone is subject to a full ‘factory re-set’, those ‘special pictures’ your lover sent you can actually be retrieved by a third party. People who are now wondering if their naked selfies are being perved over by complete strangers at this very moment (it is possible, I’m afraid). …And the people who are expectantly clutching their second-hand phones and waiting for me to get to the bit where I explain how to obtain these pictures (shame on you, but hang in there, we’ll get to it in a bit!). Well, whichever you are, you should know that the firm used publicly available forensic technology to extract, not only naked selfies, but ALL SORTS of other data from second hand phones they purchased on eBay (however, they were clearly most excited about the selfies – computer nerds don’t get out much, after all). According to experts, the only way to PERMANENTLY delete these images from your phone is to destroy your phone. Now, if you’re the smug type of reader, who thinks ‘I never took a naked selfie, so I’m in the clear’…Well, I’m here to tell you that you may be facing an even more embarrassing problem than that of a stranger on the Internet getting a gander at your goodies, because other data extracted from the test phones included texts, emails and Google search data. I’m also here to tell you that you’re a pretty boring person. I’ll bet you wish they’d been distracted by your bits now, don’t you? Of the 20 phones examined by Avast, about 40,000 photos were extracted and about 750 of them depicted women in the nip (or near to it), whilst 250 or so depicted (to quote Avast) “the previous user’s manhood”. So, the moral of the story appears to be that, if you want to continue getting those ‘special messages’ from that ‘special someone’ then for Pete’s sake…Don’t show them this article.